We live in the San Gorgonio Pass in southern California. The views of the snow capped mountains surrounding our narrow pass filled with assorted fruit trees is breath taking. Beaumont, also known as "beautiful mountain", is known for its Cherry Festival in June. 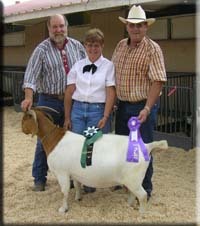 Since I can remember, I've had a special love of goats. About 7 years ago, I made a big pan full of brownies and naturally Dave had to have milk with his treats. I had bought some fresh goat milk from a friend and poured it into our container. Dave didn't know it wasn't cow's milk. After his second glass of milk I asked Dave if we could get a goat. He said he didn't think he'd like the milk. I told him he'd just had two glasses and thought it was great! He said I'd pulled a cheap trick but within a week we found our first Nubian dairy goat named "Savannah" and the rest is history.